 Defeat Corporate Saffron Fascist Forces! Budget As a Means of Purchasing Votes? Since its ascendancy to power in 2014 with just 31% of the polled votes in the context of disunity among the opposition parties, the corporate-saffron Modi regime has been systematically manipulating or undermining the parliamentary institutions, constitutional offices and all administrative bodies in conformity with its sinister Hindutva design. Of course, a party or conglomeration of parties that gobbles up less than one-third of polled votes capturing power itself is a manifestation of the fundamental weakness of the parliamentary-electoral system that India still pursues. And what Modi did during the last five years was making the parliament as a mere spectator and surpassing or distancing himself from it with regard to strategic policy decisions. In the meanwhile, the saffron fascists in consonance with their ultra-rightist orientation of entrusting economic power with corporate-market forces had already abolished the Planning Commission and made the entire budgetary process a mockery as most of the key economic questions and policy decisions are resolved outside the budget. Another poll promise of Modi was regarding the creation of 2 crore jobs per annum. But under Modi what occurred has been a total disruption of the productive and employment-oriented sectors of the economy. Not only no new jobs were created, but according to the 2018 statistics, the country is actually losing more than 1 crore jobs per annum. Even the logo of the much trumpeted “Make in India” was designed abroad and the unhindered entry of foreign capital in to the economy and concomitant growth of crony capitalism has led to an unparalleled joblessness. Demonetisation that denied cash transactions that form the life-blood for the informal sectors where 93 percent of the workforce depends for sustenance was a mortal blow for the unemployed millions. Further GST that put the tax burden on the unorganised sectors also resulted in massive job loss. Modi has not taken any step to fill the 24 lakh vacant posts in the central government sector so far. Decreasing the price of petrol to Rs. 40 per litre, reversing the depreciation of rupee, ban on FDI in retail, etc. were similar election promises of Modi; but what happened was the opposite. It was under his 5 year-rule that the number of peasant suicides crossed all previous records. Thus goes the list, and by this time Modi has proved an expert in the art of making election stunts. The pension scheme, namely, Pradhan Mantri Shram Yogi Maandhan addressed to informal or unorganised workers envisaging social security for 10 crore among them is the second in the series of dole-outs. According to this scheme, an unorganised worker who carries on remitting Rs. 100 per month as premium shall get Rs. 3000 as pension if she/he is lucky enough to live beyond the age of 60. Today more than 93 percent (around 45 crores) of the Indian workforce is depending on the informal/unorganised sector which is totally outside the social security net including pension. During its five-year term, the Modi government has done nothing to deal with the pitiable situation of this largest section of Indian society. On the other hand, demonetisation and GST designed at the behest of corporate centres have devastated the unorganised altogether. How can a casual worker in India regularly remit Rs. 100 per month for 30 years or more until he/she reaches is itself a serious question. No analysis is needed on the part of well-meaning people to easily comprehend the cunningness behind this announcement targeted at informal workers. Coming to the resource mobilisation front on the other, no new efforts are there to tax the superrich and the billionaires who control the entire reins of the economy. While the number of billionaires and wealth accumulation by them are galloping, there is no move in the direction of reinstating the wealth tax which the BJP government had abolished in 2015, and no initiative is there to bring the spectacular speculative gains gobbled up by the top one percent of financial elite who controls 73 percent of the additional wealth created in India under the Modi regime. Consequently, direct tax collection as a proportion of total collection is steeply going down. Under the new GST regime, (GST-evasion by leading corporate businesses who control the market for goods and services is also resulting in loss in revenue collection through this route also) there has been a further shift of the tax burden to the shoulders of broad masses of toiling people. While the direct-indirect tax (burden of the latter is borne by common people) ratio in India is 35:65, the reverse is the case with other countries in general. According to conventional bourgeois economic theory, increasing wealth concentration is a favourable condition for taxing the rich more intensively and improving the tax-GDP ratio which for India, despite very unequal, is one of the lowest in the world. With the existing nominal corporation tax rate of 25 percent (the effective rate while taking the exemptions in to account will come to around 15-16 % only),the tax burden on the upper richest section is one of the lowest in the world, even much below that of the leading capitalist countries. Modi-bhakts and saffron intellectuals who become ecstatic about the dole-outs to the poor are conveniently silent over this grave inequity in the budget. Thus, in view of the impending Lok Sabha elections, the Modi government which during the past five years has been ignoring or side-lining the vast majority of the poor voters and shamelessly serving the most corrupt corporate class, is suddenly bending back to appease the voters through several allurements throwing to winds the so called solemn principles of bourgeois budget. Needless to say that this attempt at winning election with a populist budget is an insult to the political consciousness of the people. Vast majority of the people are suffering from lack of food, shelter, livelihood, essential services such as drinking water, education, health facilities, and other basic amenities indispensable for a decent life. Modi’s last budget has treated all of them as if they are last-minute deliverables, while over the years he has been destroying the foundations of the economy by facilitating the corporate plunderers, both Indian and foreign, to loot the workers and country’s resources under the camouflage of “make in India”, “start-up India”, “skill India”, etc. While his doctored statistics claim about the biggest GDP growth rates for India, it is a fact of life that people are not experiencing it. As a manifestation, unemployment rate is the highest in 45 years, that is, since the 1970s and agriculture growth has become negative. Around 60 percent of the GDP growth that Modi claims comes from the money-spinning service or tertiary sector, even as agriculture (where almost 50 percent of the Indians still cling on for sustenance) and industry are displaying deterioration. And the money-spinning, speculative service sector, on the other hand, provides employment only to less than 10 percent of the population. Nothing substantial is done towards creation of gainful employment to the unemployed whose number is now reaching 20 crores — much larger than the total population of many European countries taken together. Modi has cleverly excluded the issue of unemployment and corruption from his election stunt this time. 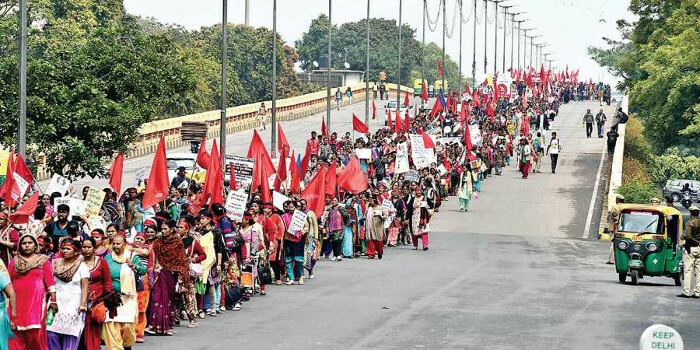 The massive rally was also organised against the Narendra Modi-led Bharatiya Janata Party (BJP) government’s attempts to weaken the labour laws and privatise the public sector. The rally began at Ramlila Maidan and ended at Sansad Marg. It was attended by workers from around 20 states across the country. “Today, neoliberalism, and especially the present regime backed by fascist forces, is wreaking total havoc on the toilers of the country. We see increased exploitation, repression and criminalisation of workers, intensifying contractualisation and unemployment, falling real wages and standards of living. But in the current context, where war hysteria peaks before the election, the issues of workers and farmers are completely absent from discourse. Hence, there was a need for the rally,” a volunteer of MASA said in a report by The New Indian Express. US dumps Nuclear Plants in India as Compensation for losing Cheap Venezuelan Oil ? As India is moving towards the election of a new government at the Centre, at the 9th round of US-India Strategic Security Dialogue in Washington on May 13, the Modi regime in violation of established precedents has once again succumbed to Trump’s pressure for establishing 6 US nuclear power plants in India. The Modi regime has already yielded to the US diktat by agreeing to a review its import of cheap oil from Venezuela in continuation of agreeing in principle to the Yanki demand to cut oil import from Iran. As of now, India is the second largest buyer of crude oil from Venezuela, and the new US challenge that follows in the aftermath of US trade sanctions for not providing “equitable and reasonable access to the markets of India” is going to aggravate the worst economic downturn and inflation that the country is confronting under the Modi regime. Trump administration that has already prepared a blueprint for regime change in Venezuela is planning an economic embargo over it and its diktat to Modi regime to stop oil import from that country should be seen as part of this agenda. Following this, while directives have been issued to public sector oil refineries, Reliance, India’s largest refiner is reportedly in close coordination with US State Department to ensure full compliance. It is in this context that US imperialism has strengthened its pressure on Modi to accept its supply of 6 nuclear reactors as an alternate source of energy. The American lackeys in Modi regime who have taken part in the Strategic Security Dialogue is reported to have agreed to the US ‘offer’ in view of US support of India’s membership in Nuclear Suppliers Group (NSG). Details on all issues including liability rules especially relating to who should shoulder the costs and responsibility of an accident are not yet known. Ironically, to overcome the US isolation in relation to the Paris Climate Agreement, American think-tanks and ruling establishment have once again started proposing “carbon-free” nuclear energy as a “catch-all solution” to climate change and the Indian technocrats are also echoing the same despite the extreme mistrust on nuclear plants prevailing India among all concerned, especially with regard to nuclear accidents, waste disposal and high expenses. Therefore, it is high time on the part of all sections to come out strongly resisting and defeating this anti-national move by Modi regime, that too at the fag-end of its rule. * Defeat Corporate Hindutwa Fascist BJP. * Defeat Anti-People BJD, Congress & their allies. * Build People’s Alternative based on Independent Left Assertion. * Vote for CPI(ML) Red Star Candidates. MARCH FOR PEOPLE’S DEMOCRACY & ALTERNATIVE SYSTEM. The list of candidates was also announced. The Party would field 5 candidates in the elections to the Lok Sabha and 3 candidates in the elections to the Bidhan Sabha. 5. Puri - Ranjan Mishra. 3. Bhubaneswar North – Rajendra Prasad Barik. The Party would also support Independent candidate Advocate Abani Gaya in the Brahmapur Bidhan Sabha seat. In fact, intellectuals, concerned citizens and social activists of Brahmapur City, Ganjam District, Odisha, have decided to support Advocate Abani Gaya, leader of Save Medical Movement/ Health/ Education Movement as MLA candidate from Brahmapur. This was declared on March 12 in an intellectuals’ and activists’ joint meeting at NGO Hall, Gate Bazar. Abani Gaya is a committed and dedicated activist and advocate. He has a clear stand against corporate, communal fascist forces and is against anti-people, neo-liberal policies and forces. The Karnataka state executive committee of Communist Party of India (Marxist-Leninist) Red Star met at the Bangalore party office on March 10, 2019, and issued the following statement on the forthcoming general elections. Defeat corporate saffron fascist BJP! The Party will support Independent candidate Prakash Raj in Bangalore Central constituency and also other candidates who are really fighting against neo liberal policies and communal fascism. Crony Capitalism Foils Election Commission’s Move to Curb Black Money in Elections. Therefore led by BJP, the electoral bonds scheme, which has become a synonym for corruption and crony capitalism will make the 2019 election the most corrupt. And the EC’s much publicised talk of curbing black money use in election will remain as mere wishful thinking as thousands of crores of black money without any transparency flow uninterruptedly in to campaign financing. It was on March 14 that 108 eminent economists and social scientists from the academic profession issued a statement questioning the credibility of Modi government’s statistics “for being influenced and indeed even controlled by political consideration” and called for restoration of "institutional independence" and integrity to the statistical organisations. As in the case of other autonomous institutions, the Modi regime is alleged to have made systematic political interference in India’s statistical machinery such as CSO and NSSO “to suppress uncomfortable data” leading to the recent resignation of two members of the National Statistical Commission itself. However, while leading accountants and auditors are driven to quick defence of the corporate-saffron regime, at a global level, the audit& accounts profession, on account of its proximity to corporatisation and financialisation, is in acute crisis today. Leading audit firms such as KPMG, Deloitte, PwC, and EY and the professionals associated with them are already blacklisted by several countries on account of their unholy alliance with corporate CEOs. In the mad rush for ensuring fabulous profits for corporate capital, leading auditing and accounting firms work hand in glove with corporate thugs leading to financial swindles, artificial fixing of asset prices and account manipulations for shoring up corporate profits. Auditing and accounting scandals associated with the collapse of Lehman Brothers are a much discussed topic. What are being exposed through the Paradise Papers and Panama Papers including the links between audit firms and tax havens whose undercurrents are manifested in India too are intimately connected with account manipulation under neoliberal crony capitalism. This being the situation, that is, at a time when the credibility of the accounting and auditing profession on account of its unholy nexus with corporate capital is at a low ebb, the aforesaid position of the economists seems credible as against the counter-statement that came in the garb of chartered accountants. CONDEMN CORPORATE AND STATE VIOLENCE IN LANJIGARH! UPHOLD RIGHT TO DISSENT OF THE STRUGGLING PEOPLE OF NIYAMGIRI! !